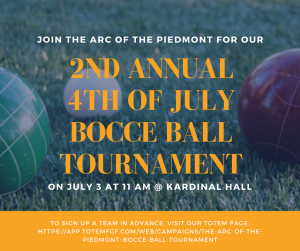 Don’t miss out on the Second Annual Arc Bocce Tournament! Monday, July. 3rd, 11:00 AM at Kardinal Hall in Charlottesville, VA.
Register your two person team by clicking the image below. Help support The Arc of the Piedmont (Virginia) reach our goal of $80,000 for 2017. Every dollar raised will be matched by The Perry Foundation to help The Arc in purchasing and renovating our NEW Activity Building to help people with Developmental Disabilities participate and interact in our community!